Evidence of Dickens's interest in the important subject of education appears in his fiction, journalism and public speeches. While he was sensitive to the various educational developments which occurred in his lifetime, he stopped short of offering practical solutions to problems, and his work only reflects a selected range of issues and institutions. He was a strong believer in universal, non-sectarian education, though not necessarily under a state system. He never joined any of the reforming societies, and seemed more comfortable dealing with particular cases and large principles, rather than legislation and administration. His general outlook on the subject is encapsulated in a speech he gave in Birmingham in 1844; he said, "If you would reward honesty, if you would give encouragement to good, if you would stimulate the idle, eradicate evil, or correct what is bad, education -- comprehensive liberal education -- is the one thing needful, and the one effective end" (Speeches 63). Dickens's early years coincided with the state's growing sense of responsibility for the instruction of its citizens. Access to education varied tremendously, according to location, gender, and class. Those who could pay for their schooling had access to several types of institutions -- though quality was by no means guaranteed. Dickens's own experience is case in point: his education, which he acknowledged to have been "irregular" (letter of July 1838), and relatively slight, began in Chatham, where he was a pupil at a dame-school -- a deficient private establishment with an unqualified woman at its head, similar to the one run by Mr. Wopsle's great-aunt (GE 7). Then in 1821 he moved on to the Rev. William Giles's School, where his experiences were more positive. He parted with Giles in 1822, when the Dickens family transferred to London, and in 1824, when they moved into the Marshalsea, Dickens went to reside with a Mrs. Roylance, the original of Mrs. Pipchin (DS 8). His formal schooling resumed in 1825, when he was sent to Wellington House Classical and Commercial Academy, run by the sadistic William Jones, who was the original for Mr. Creakle, and whose school was the inspiration for Salem House (DC 5-7). Dickens's experiences prompted two other recollections of Wellington House: in his essay "Our School' he noted that Jones ("the Chief") had a penchant for ruling ciphering-books, and then "smiting the palms of offenders with the same diabolical instrument" (HW 4, 11 October 1851); in a speech of 1857 he remarked that it was Jones's business "to make as much out of us and put as little into us as possible" (Speeches 240). There were, however, positive aspects to Dickens's time at the school: he spoke well of the English teacher, Mr. Taylor, who had features in common with Mr. Mell (DC 5-7, 63), and the Latin master, who "took great pains when he saw intelligence and a desire to learn" (HW 4, 11 October 1851). By the time Dickens left in 1827 he had won the Latin prize. While Dickens, as the son of a clerk, acquired some formal education, provision for the poor was far less readily assured. Wider access was facilitated by the non-sectarian British and Foreign School Society (founded 1808), and the strongly religious National Society for Promoting the Education of the Poor in the Principles of the Established Church (founded 1811); both used the large-scale monitorial system, and between them they administered over 18,000 schools by 1851. Dickens objected to the National Society's insistence on church intervention in education, declaring that the "Catechism is wholly inapplicable to the state of ignorance that now prevails" (letter of 16 September 1843). This comment is characteristic of a larger controversy: for much of the nineteenth century the issue of religious education proved to be the key obstacle in developing a pervasive national school system. Dickens developed this idea imaginatively in "A December Vision," which contains a portrait of priests and teachers arguing over -- but never agreeing on -- what to teach (HW 2, 14 December 1850). Dickens found an ally in his promotion of non-sectarian education and concern for the poor and deprived in James Kay-Shuttleworth (1804-77), a former assistant poor-law commissioner, statistician, and critic of the monitorial system, who in 1839 became the first secretary of the Committee of the Privy Council on Education, and laid the foundation for a national system of popular education. He opened the first teacher training college (in Battersea, 1840); reported on the training of pauper children (1841); instituted the pupil-teacher apprentice system to counter the shortage and poor quality of elementary teachers (1846); and developed an inspectorate for those schools which received government grants. Dickens made his acquaintance in 1846, and found that they shared an interest in Ragged Schools (right) -- those institutions which, as their name suggests, accepted the raggedest of children. In 1843 Dickens began his frequent visits to these schools, and became one of their most prominent supporters, though he was also aware of their limitations -- particularly the lack of qualified teaching staff. Ragged Schools found their way into his journalism (HW 4, 13 March 1852) and his fiction, where Charley Hexam calls his first school a "temple of good intentions" (OMF 2.1). 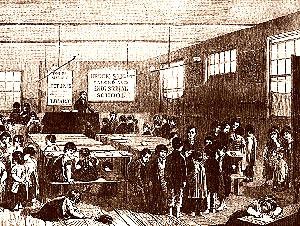 Dickens even wrote to Kay-Shuttleworth proposing that they establish a model ragged school; he enthusiastically declared, "surely you and I could set one going' (letter of 28 March 1846). While Kay-Shuttleworth's influence and expertise were recognised by both Dickens and Angela Burdett-Coutts (who enlisted the reformer's aid in developing the mark system for Urania Cottage), there were other issues on which he and Dickens diverged -- particularly educational methods, school inspections, and teacher training. One strategy singled out by Dickens for criticism in Hard Times was the object lesson, originally conceived by the Swiss educationalist Johann Pestalozzi (1746-1827) as a method of instruction deriving from children's own experiences, and suited to their particular stage of development, but distorted in its translation to England by Charles and Elizabeth Mayo, particularly through the latter's Lessons on Objects (1831). Form acquired ascendancy over subject matter, producing lessons whose vocabulary and content (including Latinate phrases and scientific jargon) were not suited to children's experience. Kay-Shuttleworth helped to popularize the object lesson by including it in the curriculum for his Battersea teacher training college, which then became the model for many others. Dickens's critique is embodied in the exchange between Gradgrind, Bitzer and Sissy Jupe over the proper definition of a horse. Bitzer, who has learned a definition by rote, classifies it as a "Quadruped" and "Gramnivorous," whereas Sissy, the horse-breaker's daughter dubbed "Girl number twenty," is reprimanded for possessing "no facts, in reference to one of the commonest of animals" (HT 1.2). The object lesson is also recalled in Nicholas Nickleby, where Squeers describes a horse as "a quadruped, and quadruped's Latin for beast, as everybody that's gone through the grammar knows" (NN 8). The educational critique in Hard Times confirms Dickens's familiarity with pedagogical developments. He had read Kay-Shuttleworth's Public Education (1853), and lamented the "supernatural dreariness" of its supporting tables and statistics (letter of 1 April 1853); also, Dickens asked W.H. Wills to obtain for him a copy of the Education Committee's examination for teachers, for use in the opening chapters (see letter of 25 January 1854). The novel's depiction of the government inspector, identified as the "third gentleman" (HT 1.2), owes its inspiration to the art critic and designer Henry Cole (1808-82), one of the prime movers behind the Great Exhibition of 1851, who had recently been appointed Superintendent of the Department of Practical Art. Dickens reflected the recent introduction of elementary drawing into the curriculum, and satirized Coles's direction of industrial design for consumer goods, by having this "professed pugilist" test the children's judgment about whether or not to "paper a room with representations of horses" (HT 1.2). The decidedly negative response, and the equation of taste with fact -- which Cole seems to have received with good humour (see letter of 17 June 1854) -- confirms Dickens's disapproval of such unimaginative exponents of rational aesthetics. The presentation of Mr. M'Choakumchild is further evidence of Dickens's interest in contemporary developments. The schoolmaster is the product of Kay-Shuttleworth's pupil-teacher system, which apprenticed proficient boys and girls to school managers for five years, before allowing them to enter the training colleges for a maximum of three years, and then to graduate as certified teachers; the scheme produced its first "Queen's Scholars" in 1853. While Dickens had argued against the employment of unqualified individuals as teachers (HW 4, 13 March 1852; HW 5, 11 September 1852), he also deprecated what he considered "Kayshuttleworthian nonsense" (letter of 9 December 1856). Thus he presented M'Choakumchild as one of those who had "been lately turned at the same time, in the same factory, on the same principles, like so many pianoforte legs" (HT 1.2). The list of subjects mastered, ranging from "Orthography, etymology, syntax, and prosody" to "all the productions, manners, and customs of all the countries" left little time to develop teaching skills. As Dickens noted, "If he had only learnt a little less, how infinitely better he might have taught much more" (HT 1.2). While M'Choakumchild features only briefly in Hard Times, in Our Mutual Friend a teacher occupies a far more prominent position in the narrative. Bradley Headstone, described as a "highly certificated stipendiary schoolmaster" (OMF 2.1) is also a product of the training college system, and his conception follows the 1861 report of the Newcastle Commission, appointed to examine the possibility of extending sound elementary education to all classes. Its investigations revealed that the basics of education were being neglected, as Kay-Shuttleworth's colleges emphasised academic endeavour to the extent that graduates became out of touch with their pupils, and thus could not do their job properly. Our Mutual Friend considers the sociological development of the new generation of teachers: Headstone, and his pupil-teacher Charley Hexam, are products of the best education available to individuals from poor backgrounds, who are encouraged to rise above their social origins in their quest for respectability. The training college experience is again presented unsympathetically by Dickens: Headstone "had acquired mechanically a great store of teacher's knowledge," to the point where his mental "wholesale warehouse" was "always ready to meet the demands of retail dealers" (OMF 2.1); though relatively well paid, and thus reflecting the enhanced status of qualified teachers, he displays a vicious temperament, which proves to be his undoing. Headstone's respectability is precarious. He falls for Lizzie Hexam, but because of his obnoxious behaviour is rejected. Dickens exacerbates this feeling of injustice by positing as his rival Eugene Wrayburn -- the indolent, briefless barrister, who has the benefit of a public school education. Their confrontation (which recalls the exchange between Steerforth and Mr. Mell in DC 7) serves as an indictment of the whole teaching profession. Dickens continually takes Wrayburn's side in the rivalry over Lizzie, stressing the "boyish weakness" and "great selfishness" of Headstone's speech, and presenting his short temper and "consciously bad grace" as evidence of unworthiness. While Headstone declares that he has a "right to be considered a better man" than Wrayburn, with "better reasons for being proud," the latter calmly counters, "How I can reproach you with what is not within my knowledge, or how I can cast stones that were never in my hand, is a problem for the ingenuity of a schoolmaster to prove" (OMF 2.6). By making the character of Headstone a significant element in the plot, Dickens highlights several considerations for the new generation of teachers: the struggle to achieve the essential certificate and become a "Queen's Scholar"; the conceit prompted by the achievement of this status; the temptation to disregard their roots as a safeguard of respectability; and their jealousy of social groups who enjoy privilege without having to work for it. Because the middle-class fee-paying institutions of Dickens's day did not depend on either charitable subscriptions or state funding, there was greater variation in standards and conditions, and thus more opportunity for imaginative expression. Many of the establishments for girls -- about which Dickens knew relatively little -- are presented comically, including Minerva House, in which the pupils "acquired a smattering of everything and a knowledge of nothing" (SB 47); Westgate House, to which Mr. Pickwick is lured by the threat of Jingle's elopement (PP 16); Mrs. Wackles's day school, where "writing, arithmetic, dancing, music, and general fascination" are taught (OCS 8); Miss Monflathers's Boarding and Day Establishment, into which "nothing in the shape of a man -- no, not even a milkman -- was suffered, without special license, to pass" (OCS 31), and the "Lilliputian College" in "Tom Tiddler's Ground" run by Miss Pupford, who gives a lecture on the mythology of the heathens, "always carefully excluding Cupid from recognition" (CS 14). The perspective adopted in these portraits is that of a casual adult observer, who visits an establishment generally kept by a mature, narrow-minded spinster. The humourous character of these vignettes is evidence of a typically patriarchal perspective: Dickens shared with most men of his time an ideal of femininity which emphasised the teaching of domestic crafts and responsibilities, rather than imaginative or intellectual pursuits. When Dickens turns his attention to fee-paying establishments for boys, they are treated far more seriously, and the perspective is generally that of the anguished pupil. Such is the character of Dotheboys Hall in Nicholas Nickleby, run by the sadistic Wackford Squeers (NN 8, 9, 12, 13). The novel served as a vehicle for exposing the dreadful conditions in the Yorkshire schools -- those private venture boarding schools which catered for unwanted -- often illegitimate -- children, who were kept throughout the year at cheap rates. Dickens travelled under a pseudonym to visit these establishments with Phiz in 1838, and denounced them as examples of "the monstrous neglect of education in England"; he claimed that Squeers and his school were "faint and feeble pictures of an existing reality, purposely subdued and kept down lest they should be deemed impossible" (1839 preface to NN). In Nicholas's first sight of the "bare and dirty" classroom the hopeless situation of the boys (Squeers's "proper and natural enemies") is highlighted: "With every kindly sympathy and affection blasted in its birth, with every young and healthy feeling flogged and starved down, with every revengeful passion that can foster in swollen hearts eating its evil way to their core in silence, what an incipient Hell was breeding here!" (NN 8). Pathos is elicited through the character of Smike, a "crushed boy" whose "long and very sad history" is punctuated by "stripes and blows, stripes and blows, morning, noon, and night" (NN 7, 12); his suffering and eventual death are directly attributable to Squeers's sadistic regime. This formidable -- and largely undeniable -- attack on such schools lent imaginative weight to indictments which had been circulating about such places as William Shaw's Bowes Academy at Greta Bridge, and helped to speed their demise. While Squeers's designs are undeniably malevolent, in Dombey and Son Dickens focuses on a well-intentioned schoolmaster whose shortcoming is a deficient methodology. Little Paul progresses from Mrs. Pipchin's, where the system was "not to encourage a child's mind to develop and expand itself like a young flower, but to open it by force like an oyster" (DS 8), to Dr. Blimber's academy, where he is sent by a father impatient for his son's advancement. The pompous Blimber runs "a great hothouse, in which there was a forcing apparatus incessantly at work," assisted by his daughter Cornelia, "dry and sandy with working in the graves of deceased languages," and Mr. Feeder, BA, the "human barrel-organ" (DS 8, 11, 12). Dickens seized the opportunity to offer a critique on the premature acquisition of mathematical skill, but more importantly of classical languages, which were not only essential for university entrance, but were seen as valued culture-tokens for increasing self-respect. The boys' plight is communicated through Mr. Feeder's method of instruction: "They knew no rest from the pursuit of strong-hearted verbs, savage noun-substantives, inflexible syntactic passages, and ghosts of exercises that appeared to them in their dreams" (DS 11). They reach the conclusion that "all the fancies of the poets, and lessons of the sages, were a mere collection of words and grammar, and had no other meaning in the world" (DS 12). It is interesting to note that although Paul Dombey's death is accelerated by the Blimber regime he -- and other pupils like Toots -- regard the school with affection. While most of his fictional portraits are of children's schools, Dickens was also a strong, vocal supporter of adult education, particularly mechanics' institutes -- those establishments offering instruction to subscribing artisans and skilled workers; by 1850 there were about 700 such foundations, claiming a membership of 100,000. Dickens was elected president of mechanics' institutes in Chatham, Birmingham, and Reading, and gave readings to raise funds for them; despite this seriousness of purpose, he was not averse to offering a comical account in "Dullborough Town' (UT 12). He was also present at various foundings, soirees, and prize-givings from 1843 onward, giving speeches which reviewed resources and achievements, fees levied, number of volumes in the libraries, and courses offered. In 1844 he proclaimed of the Liverpool Mechanics' Institution: "Every man who has felt the advantages of, or has received improvement in, this place, carries its benefits into the society in which he moves, and puts them out at compound interest, and what the blessed sum may be at last, no man can tell" (Speeches 54). Dickens believed in the extension of education on sound principles to all citizens; yet he did not offer specific strategies for achieving this aim. He exposed what he considered abuses and deficiencies, and praised what he believed were positive developments. He was a pioneer in introducing the theme of education into prose fiction, and proved, in his correspondence, journalism and speeches, that he had greater familiarity with the subject than most of his rivals. In the year of his death Parliament passed the Elementary Education Act, which further raised the standard of teacher training and effectively inaugurated compulsory schooling. If Dickens made any practical contribution to achieving this end, it was by reinforcing the public's sense of moral feeling, and providing additional momentum for change. Adrian, A., "Nicholas Nickleby and Educational Reform', Nineteenth Century Fiction 4 (1949). Altick, R., "Education, Print and Paper in Our Mutual Friend', in C. de L. Ryals (ed. ), Nineteenth-Century Literary Perspectives: Essays in Honor of Lionel Stevenson (1974). Collins, P., Dickens and Education (rev. edn., 1964). Collins, P., "Dickens and the Ragged Schools," Dickensian 55 (1959). Gilmour, R., "The Gradgrind School: Political Economy in the Classroom," Victorian Studies 11 (1967). Kay-Shuttleworth, J., Four Periods of Public Education (1862). Shatto, S., "A complete course, according to question and answer," Dickensian 70 (1974).